Oxygen sensors have been around since the 1970's. They were invented by the engineers at Bosch and they were named Lambda sensors. Lambda is the stoichiometric ratio of fuel to air, (which is approximately 14.7 to one). 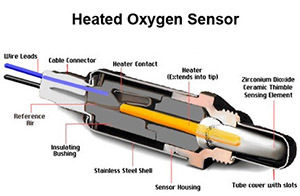 The official name of the sensor is still Lambda sensor but because they measure the unburned oxygen left in the exuast they are commonly called, "oxygen sensors". When the oxygen sensor came along it changed the way automotive technicians and engineers did their jobs. The oxygen sensor measures the leftover oxygen after cumbustion. The oxygen sensor gives data to the engine management system, (ECM) to control the amount of fuel being distributed to the engine. Before oxygen sensors came along the automotive manufacturers were having a really hard time making cars and trucks pass the strict emissions standards. Now that engineers could see how much fuel was actually being burned they could send this data to the ECM and the ECM would either apply more fuel if the engine was running too lean or add less fuel if the engine was running too lean. The ECM normally controlls this by reducing the injector on time (measured in milliseconds) in fuel injected vehicles. When the oxygen sensor measured a lean condition it sends this signal to the ECM and the ECM commands the injectors to stay open for more milliseconds. Alternately if the oxygens sensor sends a signal to the ECM that the exhaust system has too much unburned fuel leftin it then the ECM commands the injectors to open for less time. Oxygens sensors were even used in the Computer Command Carburetor through the use of a variable jet that was controlled by a computer or ECM. The one wire oxygen sensor that you see here was a revolution to the automotive industry. Like anything else after a few million of them were put into production in a few thousand different vehicles problems with the original design started to surface. one major problem was that the sensor didn't start to work until it reached a very high temperature. This meant that the engine had a tendency to run rich until the oxygen sensor warmed up and began to aid in the control of the mixture. The engineers at Bosch saw this proplem and addressed it by adding a heater system into the sensor which basically works like the old cigarrette lighter in a car. A small heating element installed inside of the sensor allowed the sensor to begin operatin after only a few seconds and allow the ECM or PCM to begin controlling the mixture sooner. This was done to extend the life of the catalytic converter. The four wire, (and sometimes 5 wire, 6 wire, or 8 wire) heated oxygen sensor took over the industry by storm and this is what is present in all modern vehicles.